The benefits of historic preservation are often overlooked because they become visible over time rather than directly and immediately. Developers and property owners often find it financially advantageous in the short term to tear down and build new, but the inherent flaws of these decisions readily come to the forefront when new construction proves inferior and inadequate after only a few years of use. Preservation of historic properties demonstrates long-term vision by retaining irreplaceable cultural, architectural, historical, and environment resources. The City of Brownsville is committed to preserving our historical homes and commercial buildings. 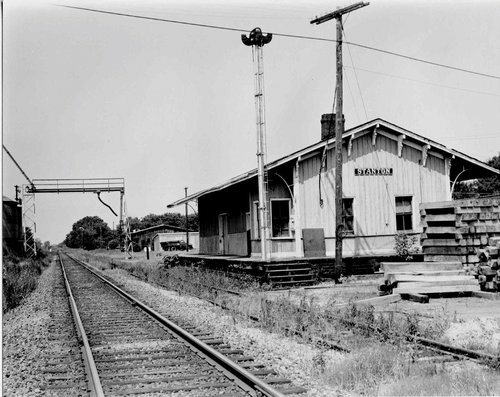 Structures located within the four designated historical districts are subject to specific guidelines regulated by the Historic Zoning Board and implemented by City of Brownsville Code Enforcement. These guidelines affect many aspects of historic property ownership and maintenance including architectural integrity, building and demolition, lighting and landscaping, and overall contribution to the neighborhood stability. This home was built in the latter half of the 19th century by James Bond, a North Carolinian whose family settled in Tennessee in the 1830s. Bond was one of the state’s wealthiest planters, and responsible for the raising of several houses along what is West Main Street in Brownsville. 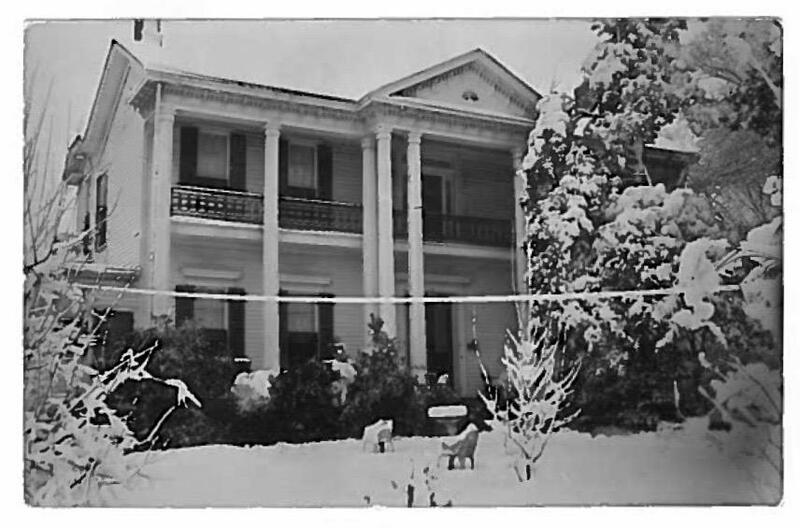 The house at its original location, as seen in a family Christmas card from the late 1950s. The house was a home to the Bond family for a century. HIs son and daughter-in-law, Lewis T. and Lettie Comegys Bond, lived there. 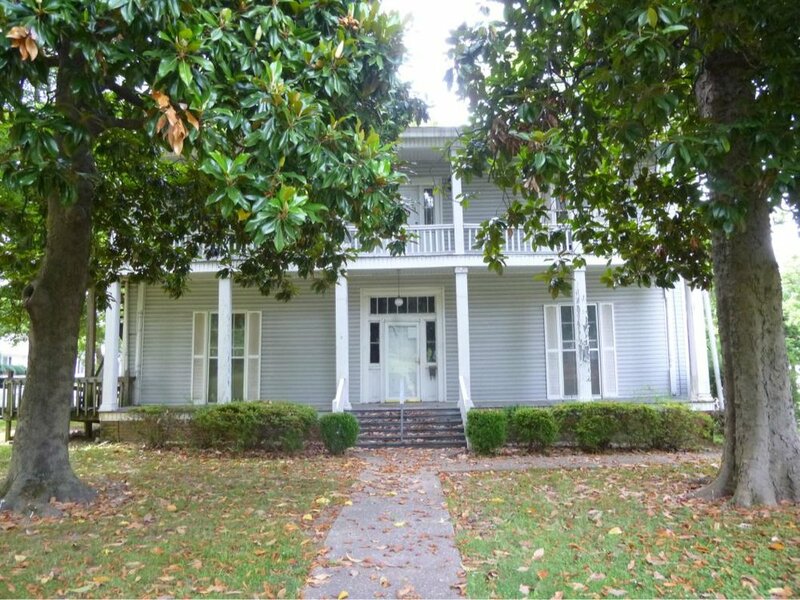 When Lewis died in 1916, the house was purchased by James’s daughter, Sallie Williamson Bond, and she and Lettie continued to live out their years there together. This home was one of the social hubs of Brownsville during this time. Lettie loved to have guests, and opened her home to weddings, receptions, dinners, breakfasts, and the like--delightful affairs accented nicely by exquisite food, candlelight, and the beautiful antique furnishings. After Lettie’s passing in 1963, the house was left to her niece, who sold it to Reverend Charles Tripp and his wife. 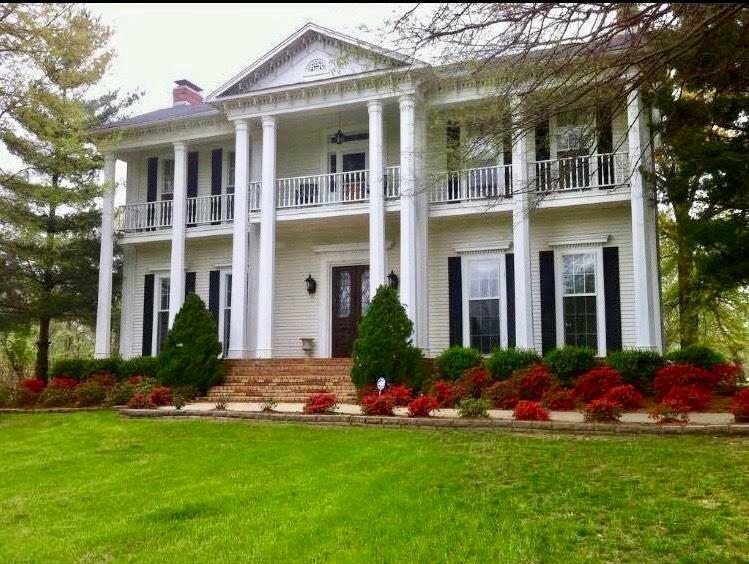 They kept the home until 1975, when it was bought by the Waldran family of Dyersburg, Tennesseee. The house as it stands today. Alice and Murray Waldran had the house moved from its original location. The Wade L. Bolton Company managed the job, splitting the house into three sections and relocating it to a hill outside Dyersburg, about 50 miles away. Today, a grocery store occupies its original place at 406 West Main Street. The Bond family’s home continues to be a beautiful element of the Tennessee landscape. It stands as a testament to the lives and memories of many Tennesseans, spanning across miles and generations. This house was constructed in the mid 1850’s by William Pitt Harvey and his wife, Mary Ann Elizabeth Claiborne, about twenty-five years after the town of Brownsville was incorporated. William was born in Virginia in 1829 and came to Brownsville as a young man seeking his fortune. Six children were born to this union, all ofwhom began life in the house on West Main Street. Harvey family descendants continued to own the house until 1983, when it was sold upon the death of Elizabeth “Red” Harvey Evans, the last of the family to reside there. The house is of frame construction built upon hand-hewn poplar log sills and is one of the oldest buildings of this type remaining in Brownsville. Most likely, the wall and roof joists were hauled to a steam mill in Memphis and returned by wagon or rail to town for use. Frame construction did not become common in West Tennessee until the mid-1800’s and was preceded by homes built from roughhewn logs. 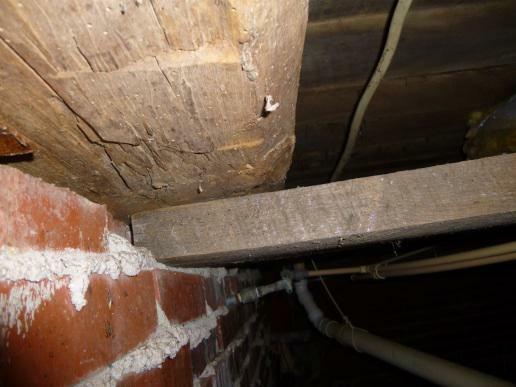 Indeed, many of the oldest frame houses still retain a wall or two of the original log design underneath layers of plaster or clapboard. 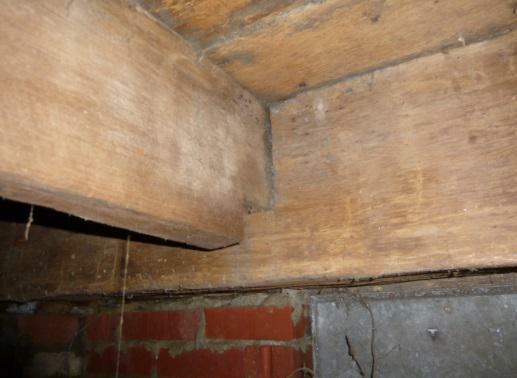 Mortise and tenon joinery was used to connect the floor joists with the log sills and wood shakes cover the roof. Examining the type of nails used in frame construction is one of the most reliable methods of dating such a building. 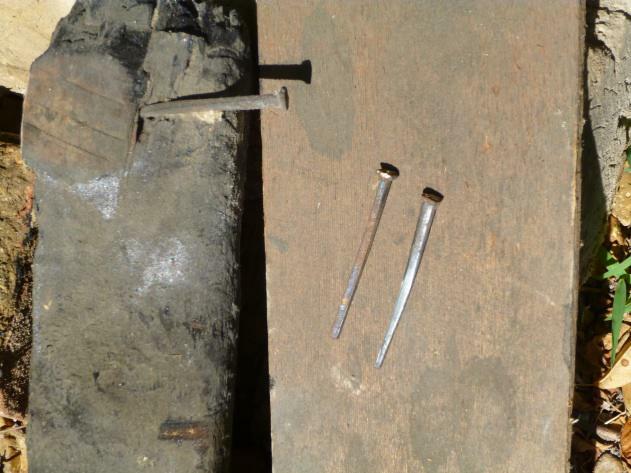 Wrought iron nails were the only ones available up to around 1795, when square cut nails with hammered heads became more common. They were used until the 1830’s, and followed by stamped-head square nails. This type remained until round nails became common towards the end of the nineteenth century. The Harvey house was constructed with stamped-head square nails of varying sizes. 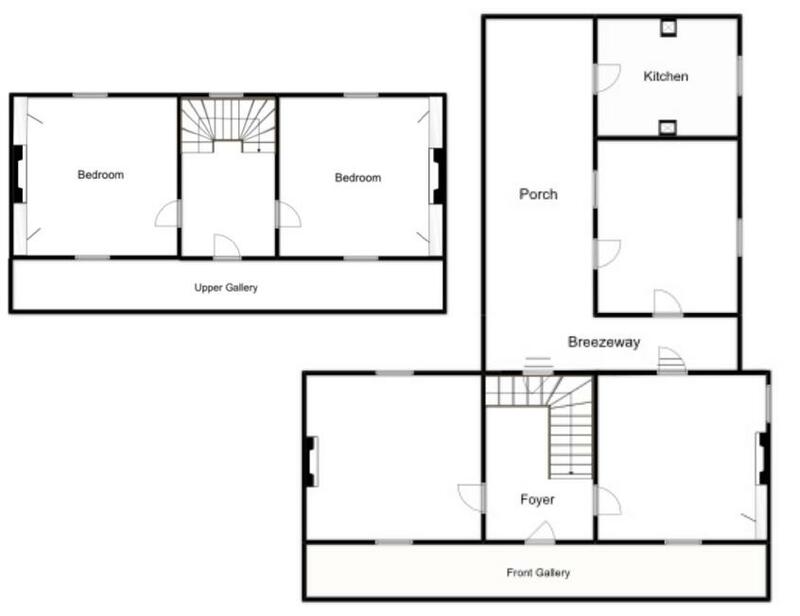 Following the common Southern I-house plan, there are two main rooms on the ground floor, each about seventeen feet by eighteen feet, separated by a central hall with stair approximately ten feet in width, and the same plan on the second level. An original ell contains two rooms, probably a kitchen and food preparation area, bordered by a long, open porch on the west side. Evidence from beneath the roof of the ell indicates there was a kitchen fire at some point and the chimney on the south wall may have been removed at this time. The north chimney is visible atop the roofline of the ell, but does not extend to the ground. Rather, the top portion rests upon a large board above the ceiling. Central passage houses often had a wing, or ell, built perpendicularly to the main house giving the entire plan the appearance of an L or T in shape. These wings often contained kitchens and other service rooms. Scholars continue to investigate the significance of these ells, but it appears they were built in an effort to accommodate the presence of slaves as they served the household. The ell allowed the home owner to observe the coming and going of servants even as he maintained a segregation and hierarchy of space. Although these theories of the central passage and ell might apply to some regions of the South, scholars have yet to systematically study this house type in Tennessee. The breezeway and rear porch have been closed-in and attached to the house. Wide galleries cross the entire length of the front façade on both levels, with square columns and rails at eight-foot intervals. Facing south, the house is designed to catch prevailing southerly breezes and to encourage airflow between rooms. Ceiling height is around ten feet throughout. For early houses in Tennessee, three house plans were common: the central passage plan, the hall-parlor plan, and the Penn-plan. The central passage plan, also called an I-house by cultural geographers, is a house with two rooms on either side of a passage, usually built to two stories. When the central passage house is two rooms deep, it is often called a Georgian plan. Although they are similar, scholars believe that the I-house and the Georgian-plan house developed for very different reasons that reflect social attitudes. Moreover, a great deal of experimentation in house forms occurred around 1800 to produce a large variety of house types. The result of this experimentation was a decided preference for a two-story, two-room house divided by a central passage. Four fireplaces, each with simple, but elegant mantels are recessed within the outside walls of the house. The resulting chimney nooks have been enclosed to form presses or closets in both upstairs bedrooms and on one side in the east downstairs room. The house retains its original floors, moldings, interior doors, and windows, although invariably some glass has been replaced. Two of the original ground-floor windows extend from ceiling to floor. 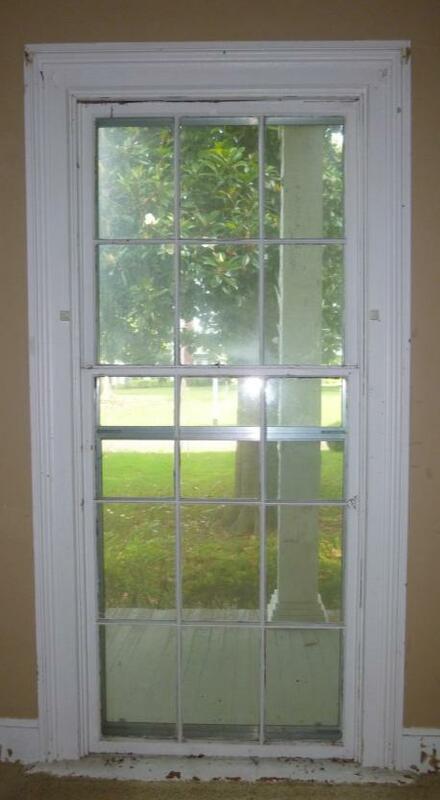 While not true jib windows, they likely served much the same purpose. At a time when antebellum structures are disappearing from the South at an ever increasing rate, the Harvey-Tripp house remains as one of the last examples of hand-crafted building techniques in Brownsville. The wood incorporated into this house was harvested from some of the last old growth trees in this area. The home provides us with a glimpse of life in the 1850’s including its comforts, pleasures, and many, compared with our modern standards, inconveniences. It was constructed during a time when houses built to last for many generations, providing security and protection from the elements for occupants. These homes were designed to work in concert with nature, catching and indeed generating cooling breezes in summer while sheltered by large leafy canopies, and warming rooms to a tolerable temperature for those accustomed to wearing many layers of clothing in winter. Kitchens were usually built separately and a good distance from the main house because they were hot and with their wood shake roofs, frequently caught fire, and because food preparation and the odors of cooking were considered undesirable sights and smells. People lived simply, worked hard, and often died at a young age, but there remains much to be learned from their time here. They were the first settlers of our county and we are now living their legacy.